The names of two more students from the Faculty of Liberal Arts & Professional Studies (LA&PS) will be added to the awards display wall in the Vari Hall Rotunda in celebration of the fifth annual Robert J. Tiffin Student Leadership Award. From multiple Faculties at York, the ten York University students receiving the award were honoured at the reception for their outstanding achievements in leadership, dedication, integrity and enthusiasm . The students received a certificate at the reception and will have the award noted on their transcripts. 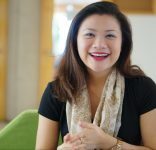 The award was created to recognize current undergraduate and graduate students whose leadership has contributed to the growth, development and vitality of York University. Students were selected on the basis of their leadership and/or involvement, as well as outstanding academic achievement. Robert Tiffin, the award’s namesake, served as York University’s vice president, Students, for nine years before retiring in 2012. Tiffin was in attendance to hand out the awards to each of the winners and described the reception as “truly one of the biggest events of the year for me”. This is the fifth year for the award, and Tiffin noted that he is honoured to have his name associated with the recipients. Rhonda Lenton, vice-president academic and provost, also shared a few words with recipients. A passionate student leader and peer mentor, Melissa served as Campus Club President for UNICEF Canada, Peer Mentor Network Leader for McLaughlin College and initiated our own SPPA Student Profiles to help junior students see all of the opportunities that our programs have to offer and help guide them through the challenges of the early years at university. As a young professional, Melissa has completed a placement with the Ministry of Government and Consumer Services, Customer Care Division of Service Ontario; Equip K.I.D.S. International and currently works for the Ministry of Health and Long-Term Care, Digital Health Solutions and Innovation Branch, Project Management Office. Melissa is also the recipient of the 2016 McLaughlin Academics Choice Award. 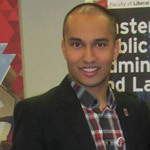 "I am a student committed to being a part of the next generation of public service servants who will continue to diligently serve the people of Ontario and Canada. Programs and Policy Assistant at Ministry of Community and Social Services." A certificate of recognition is presented to LA&PS alumni who continue to give back to the York community since having graduated from the Faculty. Recipients will have enhanced student experience by active engagement in the Faculty, either inside or outside of the classroom or through involvement with a student association. We extend heartiest Congratulations to MPPAL & SPPA Alumni, Corey Davidson and Stacey Berry. Corey Davidson graduated from the Master of Public Policy Administration and Law (MPPAL) program in October, 2013 and Stacey Berry in October, 2014. Corey and Stacey have always demonstrated great passion and diligence in promoting student engagement and promotional activities within SPPA, MPPAL and York University. Blueprint 2020 National Student Paper Competition on the Future of the Public Service Grand Prize Winners! 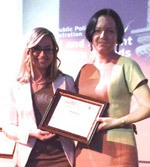 Congratulations to Anisa Vangjeli, one of the co-authors/recipients of the prize, our recent graduate from the BPA Specialized Honours, Management Stream - class of 2014. She went on to her Master's at Carleton University last year. Rising to the top of this competition is a significant achievement. Alumni Community Award winner Adriano Mena at the podium and School of Public Policy and Administration Director James Simeon. Lookin on is the evening's Master of Ceremonies, Corey DavidsonThe School of Public Policy and Administration (SPPA) held its annual Alumni and Student Recognition Awards Dinner on Nov. 27.